Stryker is a 2yo, male Dutch shepherd x Belgian Tervuren currently located in CO.
Stryker is a highly intelligent dog who will need to be challenged by having something to do. He would excel in competition obedience and other dog sports. He needs more than an active family to remain fulfilled. Stryker will need an experienced handler (ideally someone who knows the breed) as while he is eager to please and enjoys work, he is not without flaws that will require ongoing training and behavior modification. His go-to reaction is to bark, and overall he is a VERY vocal dog, so his adopter will need to continue training to reduce this behavior. He also shows some moderate barrier aggression towards other dogs and will display similar behavior toward his handler if corrected through a barrier. Stryker is a strong, assertive dog but enjoys learning new things immensely. He also seems to recover quickly and can be re-directed quite easily. Stryker is also dog-selective and will need slow, careful introductions and integration into a household with other dogs. He would not do well with other strong, pushy, bold dogs. Giving this guy another shout out. It's just so puzzling that NADSR has had such little interest in Stryker. Is it the wording of his bio (see below)? Thanks, in advance, for any feedback that might be useful! Stryker is a 2yo, male Dutch Shepherd x Belgian Tervuren. Soon after his intake into foster care, he was diagnosed with Osteochondritis Dissecans (OCD) of his left shoulder. OCD is a genetic disease in which the cartilage of the humeral head fails to form correctly and painful lesions occur. Fortunately, through generous donations, NADSR was able to provide Stryker with necessary surgery and rehabilitation. He has made a full recovery and he is now ready to find his forever home. Stryker is a highly intelligent dog who will need to be challenged by having something to do. He would excel in competition obedience and other dog sports. He needs more than an active family to remain fulfilled. Stryker will need an experienced handler (ideally someone who knows the breed) as while he is eager to please and enjoys work, he is not without flaws that will require ongoing training and behavior modification. His go-to reaction is to bark, and overall he is a VERY vocal dog, so his adopter will need to continue training to reduce this behavior. 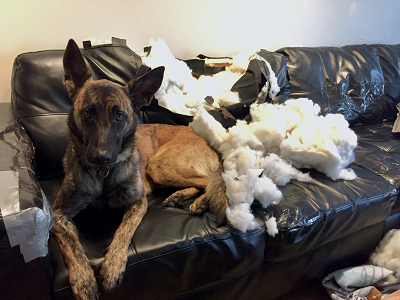 He also shows some moderate barrier aggression towards other dogs and will display similar behavior toward his handler if corrected through a barrier. He is a strong, assertive dog but enjoys learning new things immensely. He also seems to recover quickly and can be re-directed quite easily. Stryker is also dog-selective and will need slow, careful introductions and integration into a household with other dogs. He would not do well with other strong, pushy, bold dogs. He is fully crate-trained and has successfully been on a few road trips. Stryker has high prey drive so cats and small animals would be questionable (he has not been tested with either). He likes water and is learning to swim. He readily walks on a dog treadmill, both regular and underwater. He has good food drive and good toy drive. All in all, he is a super fun, loving, goofy, and sweet dog who just needs someone to bring out his full potential. Stryker young adult male 2y o is neutered, current on vaccines, heartworm negative, free of internal and external parasites, and micro-chipped. He is located in CO. If you are interested in adopting this guy, please fill out our ON-LINE Pre-Adoption application. Poor Stryker - not getting any love. He is really handsome. He likes water and is learning to swim. He readily walks on a dog treadmill, both regular and underwater. He has good food drive and good toy drive. All in all, he is a super fun, loving, goofy, and sweet dog who just needs someone to bring out his full potential. I'm going to give him another share over on the forum's Facebook page. He is so handsome. I hope he finds a home. They won’t put him down if they don’t right? I can’t imagine that happening with the surgery behind him and all. I don’t know anyone who is looking but will keep an ear out. What about posting on IG. Is that allowed? Thanks, Michael, for the share and for the feedback. Trudy and I have been wondering the same thing. His injuries are healed and he is fully rehabbed, but maybe some folks get freaked out by this. His bio is also super honest regarding some aspects of his personality and behavior, but those traits aren't unusual for a DS...or for any dog, really. Stryker is totally safe in rescue with North American Dutch Shepherd Rescue. You could share him on IG, but NADSR does not have an IG account so it would be difficult for us to follow up on any comments that express interest. Thank you Cheryl for taking the time to update us . If this part of the BIO is a problem, they probably shouldn't be looking at a Dutch Shepherd.